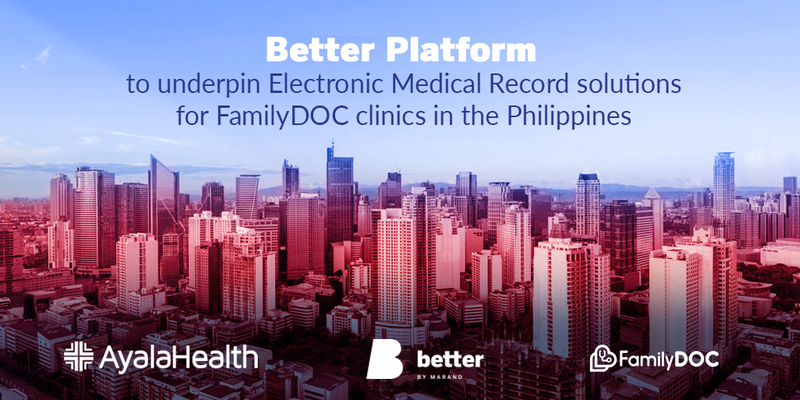 Ayala Healthcare Holdings, Inc. (AC Health), selected Better Platform to underpin the Electronic Medical Record (EMR) solutions for FamilyDOC, a new chain of community-based primary care clinics in the Philippines. The aim of building the next generation EMR is to support expansion, and create agile, open standards-based solutions that will cover all clinical and business processes for the entire chain of FamilyDOC clinics. The Better Platform will enable all FamilyDOC clinics to store data in the same format, so that doctors and nurses will always have the comprehensive set of clinical information while providing care for their patients throughout the FamilyDOC chain of clinics. FamilyDOC clinics have a unique 3-in-1 model, offering the services of an out-patient clinic, a diagnostic facility, and a pharmacy. The first two clinics were opened in 2015, followed by an additional four in 2016. In 2017, FamilyDOC will open 18 new clinics in the Greater Metro Manila area, aiming to provide accessible and affordable quality primary healthcare for Filipino families. Integral to achieving this vision is the FamilyDOC EMR system, which was customized to meet the needs of doctors and patients in a primary care setting. “AC Health is interested not only in Better’s technology and offering, but even more so in our Postmodern EHR vision and strategy,” says Miroslav Končar, Business Development Director at Better. “They were keen to learn about successful implementation of our open standard solutions at University Medical Center, and Pediatrics Clinic in Ljubljana, in particular. Think!EHR Platform™, an open and standards-based clinical data repository with a rich set of integration and development tools and focal point of our strategy, proved to be the exact solution AC Health was looking for. It would not only meet their current needs, but enable expansion of their chain of clinics and help them manage the scale and agility of their EMR system. In that sense, Think!EHR Platform™ becomes another important ingredient into FamilyDOC’s service excellence mission”. The launch of the first set of clinical applications is scheduled in June 2017, approximately seven months after the project’s inception. Furthermore, AC Health plans to continue collaborating with Better's team for capacity building and knowledge transfer. Ayala Healthcare Holdings, Inc. (AC Health) was established in June 2015 as a wholly-owned subsidiary of the Ayala Corporation, one of the largest and most diversified conglomerates in the Philippines. AC Health’s portfolio includes Generika, the pioneer in generic retail pharmacies, FamilyDOC, a new chain of community-based primary care clinics, and MedGrocer, an FDA-licensed e-pharmacy. AC Health's vision is to build an integrated healthcare ecosystem that makes quality healthcare more accessible and affordable for all Filipinos.